Picture a cube on a level surface that weighs about a kilogram. Push it and it slides, or topples if the right force is applied. The cube transforms into a sphere. Push it and it rolls. Flip the surface vertically, the object drops away. Here are the gameplay fundamentals for the excellent Grow Home, an in-house experiment that blossomed into a commercial hit for Ubisoft. It’s a visually striking title with peculiar control mechanics, almost infantile in their clumsiness, which underscore the childlike wonder and innocent triumph of a little robot’s perilous ascent through a colourful fantasy world and back to his mother ship. Yet it also evoked strong memories of a straight-edged military flight simulator I played relentlessly as a kid, A-10 Cuba! Released in 1996, A-10 Cuba! 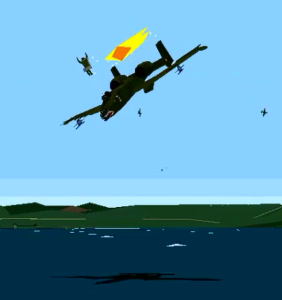 was developed by Parsoft Interactive, a studio that burned brightly (but briefly) as a standard bearer in flight simulator complexity and detail during the 90s. As with its prequel A-10 Attack! 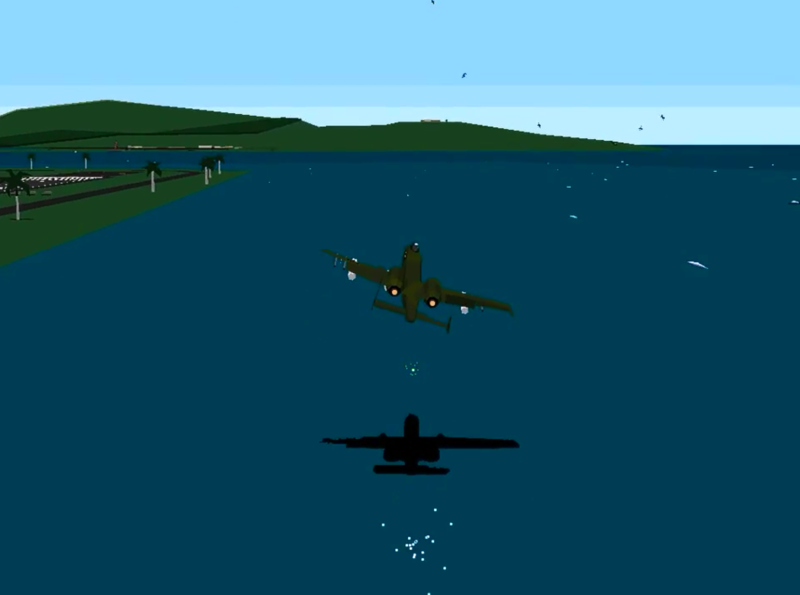 the previous year, Cuba put players in the highly interactive cockpit of an A-10 Thunderbolt II attack aircraft, shifting the theatre from Western Europe to the US military enclave at Guantanamo Bay and its hostile surroundings. There are immediate visual parallels between Grow Home and A-10 Cuba! – both employ low polygon count objects with sparse textural detail. In the case of Cuba this was, of course, a product of its era and the early Pentium-powered context in which it was produced. 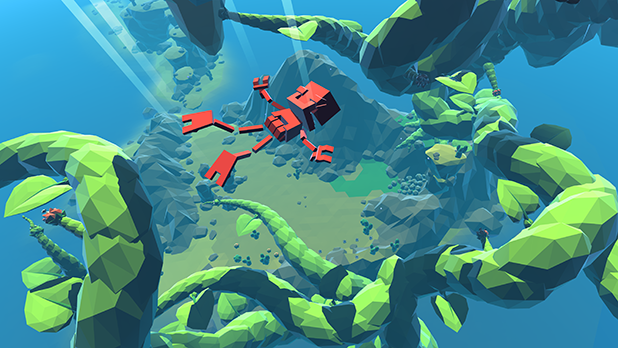 Grow Home’s visual style is something of an homage to this era, much in the same way that recent titles like Proteus and the Shelter series embrace blocky simplicity to paint their worlds. In the case of Grow Home, however, the low poly count may be as much a consequence of its “proof of concept” origins as it is a deliberate artistic choice. There is a lot to be said for this low-poly art style. It might not be as immediately evocative as ultra-detailed titles like Until Dawn that are clawing their way out of the uncanny valley, but the prominent geometry in low poly games feels easier to connect with, somehow – like you’re driving a car with the bonnet removed, the engine and moving parts proudly on display. With this type of art style – be it a deliberate choice, or one made due to development constraints – it’s almost as though the audience is invited to fill in the blank textures, taking environmental cues from broad brush strokes rather than minute details. Having said that, the world in A-10 Cuba! still felt wonderfully alive and packed with attention to detail. 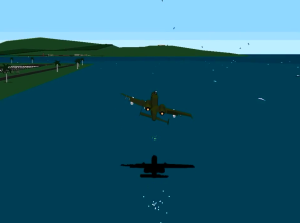 It functioned as a sandbox game, in many ways – players were given a specific mission to carry out, but the world was inhabited by numerous other military aircraft (friendly or otherwise), tanks and trucks, even civilian cars. All would go about their pre-programmed business, but if the player chose to stray off the mission path, the game was flexible enough to allow for some spectacular emergent moments. Before I obtained the full version of A-10 Cuba! I spent countless hours replaying the demo version for MacOS. The setup was always the same – take control of an inert A-10 on the tarmac at Guantanamo, a couple of F-16s scrambling to intercept some enemy MiG-29s across the bay, a C-5 Galaxy cargo aircraft lumbering in on slow approach. If you went by the book, it meant waiting for the C-5 to land before commencing your own takeoff. If you were quick enough, however, you could pull onto the runway and watch gleefully as the Galaxy’s AI pilots desperately tried to pull up and go around for another landing attempt. Sometimes they succeeded, fuselage barely clearing the runway before they gained altitude; other times, they would clip the ground and lose control, the hulking aircraft grinding across the airfield and shedding large chunks of its airframe before exploding in a bright polygonal fireball. The pilots were usually sensible enough to eject when faced with this outcome. Here is another point of convergence for A-10 Cuba! and Grow Home – both share a strong physics model, rooted in tangible gravitational forces. In Cuba, the physics felt like they had real weight and consequences. When taxiing, the A-10 would sway listlessly during turns, and its nose would dip if you hit the brakes too hard. The game physics even replicated the A-10’s legendary durability – the segmented aircraft model could lose a wingtip to battle damage (or just as often, skylarking), and while it was possible to continue flying the aircraft, it required careful airspeed management and control input to keep the A-10 level and stabilised. It’s the kind of care and due regard for gravity that was needed to navigate B.U.D. 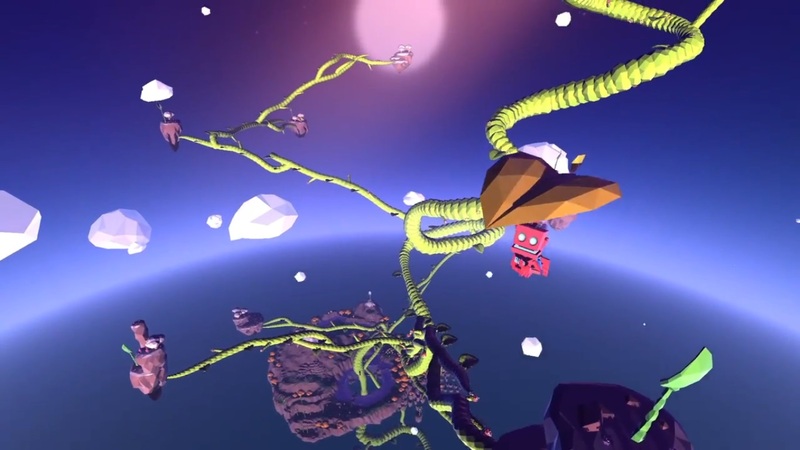 around the more vertiginous parts of the Star Plant in Grow Home. Misstep and stumble and the physics could be merciless. You might be able to make a desperate grab at the plant, or deploy a leaf glider to sail back around for another attempt at scaling it. Too often, though, it meant sending B.U.D. into a thousand metre freefall that ended with him shattering into dozens of pieces at the base of the plant. At the end of the day, Grow Home and A-10 Cuba! are vastly different gaming experiences, of course. One is a meticulously researched flight simulator, the other an exploratory sci-fi adventure (albeit with occasional flight simulator aspects). But to me, it feels like they stem from much the same place: A desire to accurately replicate the laws of mechanics and motion that we, the audience, are governed by every day. No matter how low-fi the fighter jets or roaming sheep may appear, we can immediately intuit the forces that we can apply to these objects, and accurately infer what the outcome might be – crash, shatter, restart. From Half-Life 2 to Rocket League, strong and pervasive physics modelling is not exceptional in modern gaming. But the presentation style of A-10 Cuba! and Grow Home arguably lends these games – or their physics engines, more the point – a sort of bare bones impact. Their no-frills objects, chunky and sharp-edged, seem to carry a certain knowable weight to them, like dropping a brick from a freeway overpass. Even with worlds full of hostile MiGs and carnivorous plants, the primary adversary in A-10 Cuba! and Grow Home is gravity – and by the same token, it is the feature that provides for some of their most entertaining moments.